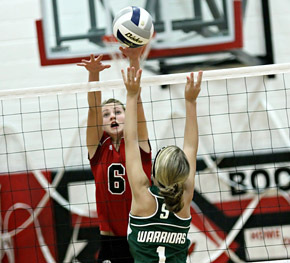 After suffering their first loss of the 2012 season last week against West Point Guardian Angels C.C., the Boone Central/Newman Grove volleyers rebounded with a strong runner-up performance in Saturday’s Boone Central Invitational at Albion. The Lady Cardinals improved their overall record to 3-2 by defeating Schuyler and Crofton before dropping a three-set decision to Lakeview in the championship match. BC/NG Coach Susan Roberts was pleased with the early sweeps over the Warriors from Schuyler (25-21, 25-19) and Crofton (25-21, 25-17) and felt her team was competitive, but ragged in the hard-fought loss to Lakeview (25-27, 25-18, 15-25). “We played very competitive volleyball all day,” Roberts praised. “I feel like we were very consistent receiving serve and attacking vs. Schuyler, and we played a very balanced, well-executed game against Crofton. We served well, passed well and hit the ball efficiently. “Up to date, that is the best execution I’ve seen from our team this season.